New Delhi, July 21: UPA-Left candidate Pratibha Patil has won the Presidential elections. She has become the first woman President of India. Patil has won by the margin of over 3 lakh votes. New Delhi: 15.jun.2007. Pratibha Patil is all set to become India's first woman President. Congress chief Sonia Gandhi declared Patil as UPA's nominee for India's highest post on Thursday evening. Pratibha, presently governor of Rajasthan is the common candidate of the Congress led ruling United Progressive Alliance (UPA) - Left combine candidate for President’s election, Sonia Gandhi, the Congress chief, announced after a UPA-Left coordination committee meeting at PM’s residence here on Thursday evening on a day, DMK’s patriarch Muthavel Karunanidhi played a stellar role hammering as much consensus as, according to some political observers, he thwarted, in conjunction with the Left and Pawar’s NCP, the chances of Sonia’s first choice, Shiv Raj Patil, the Home Minister with an image problem. 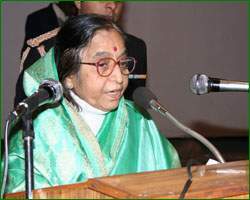 ‘There was total consensus across the board ( to Pratibha Patil)’, Jayanti Natarajan, the Congress spokesman said adding that looking at the composition of electoral college, “I have no doubt that Pratibha Patil would be the first Woman President of India” in a month from now. The reference is to the reported second thoughts in the BJP camp on fielding Vice President Bhaironsingh Shekhawat in the Presidential election slated for July 19. Senior, experienced, clean and non-controversial – that is the CV of Pratibha Patil, who is a postgraduate and is in her seventies. She is a Lingayat and hails from Jalgaon in Maharashtra and is known to be very close to the Congress leadership. 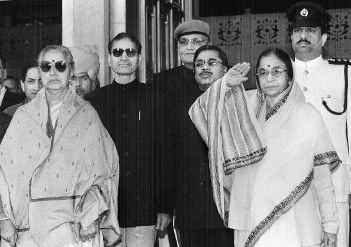 Though Pratibha Patil is still known by her maiden name, she is married to Devi Singh Shekhawat, who hails from Losal Chotti village of Sikar district—the district to which vice president Bhairon Singh Shekhawat belongs. There’s more things common between Patil and Shekhawat. While Patil’s husband name is Devi Singh Shekhawat, the vice president’s father’s name was also Devi Singh Shekhawat. Pratibha Patil’s father-in-law Ram Singh Shekhawat migrated to Amravati in Vidarbha more than a century ago. Her husband Devi Singh is a former member of Maharashtra Vidhan Sabha and is engaged in a few education projects in Amravati. .
“I am very proud of my mother”, Rajinder Shekhawat, told reporters when his mother’s name was almost finalised. Pratibha Patil had several firsts to her credit – like for instance, she was the first woman president of Maharashtra Pradesh Congress Committee (MPCC). She was a minister in Maharashtra for several years holding several portfolios before she took over as the deputy chairman of the Rajya Sabha in 1986 for two years. She was elected to the 10th Lok Sabha in 1991. And became Rajasthan Governor in November 2004 shortly after Congress retu5rned to power as the head of UPA coalition. The possibility of a senior woman becoming the consensus candidate emerged Thursday afternoon as the selection of ‘consensus’ candidate by the UPA and its Left allies for the P’ election entered the last lap in the face of stubborn opposition from the Left to all the three in Congress list Shivraj Patil - Karan Singh- Sushil Kumar Shinde. Congress President Sonia Gandhi and Prime Minister Manmohan Singh brought the smaller parties in the UPA into the consultation loop on Thursday and met Sharad Pawar (NCP), Ram Vilas Paswan (Lokjanshakti), E Ahmed (IUML), Dr Ramdas (PMK) among others. They also held a round of meeting with the Left leaders, Prakash karat et al, who were closeted with the DMK patriarch Muthavel Karunanidhi, who ever since he landed at the New Tamilnadu House in Chanakyapuri, on Wednesday night, has been straining every nerve to iron out differences between the UPA and the Left. Mr. Karunanidhi met Prakash Karat, AB Bardhan, D Raja, and other Left leaders for the second time in less than 24 hours and scheduled another meeting with them on Thursday. He also conferred with Prime Minister and Congress chief at the PM’s 7 Race course road residence. He exuded confidence that consensus would emerge without any hiccups on who would be the UPA nominee for President’s post in the election slated for July 19. Political observers familiar with the on-going consultation process have described Mr Karunanidhi as a moderating voice while sources close to the DMK ventured to compare their leader’s role to that of a king maker recalling that he had played such a role at the time of government formation of the short-lived United Front. One key player behind the scenes at the time of UF birth was Harkishan Singh Surjeet, the Marxist veteran. His presence is sorely missed this time around as he is not keeping well besides the fact he had voluntarily retired from the Marxist front line front line quite a while ago. Surjeet’s chosen successor, Prakash Karat is at the helm of AK Gopalan Bhavan. But surely old-timers may be missing the Surjeet touch, according to analysts. Dr Karan Singh met the Tamilnadu chief minister Thursday morning and the meeting pump primed speculation about his prospects as a consensus candidate. After his talks with Mr Karunanidhi, the former Sadar –e –Riyasat, told reporters that he would be happy if were to be a consensus candidate. “It will be a great honour…. I am available…..”, he said. BJP Take: Both the BJP and the Shiv Sena have made acerbic remarks on the on-going consultation process in the UPA-Left camp. “What type of consensus is this,” asked L K Advani, BJP’s erstwhile strongman. “Never were there so many names to chose from and make a spectacle…,” he remarked. Shiv Sena Pramukh, Bal Thackeray, has ‘ticked’ of fellow Maharashtrian Shiv raj Patil. “He (Patil) must prove his roots (Maharashtrian) first. Sena will not merely support him because he belongs to Maharashtra”, Thackeray wrote in his party daily ‘Saamna’. "We would be happy to have a Maharashtrian as the President though”, he said. She became the first woman leader of opposition in Maharashtra when Sharad Pawar, as the head of Purogami Lok Dal, became Maharshtra Chief Minister for the first time in July 1979. When the Congress came in power in 1982 she was made urban development minister and later civil supplies and social welfare minister.